Prime Minister Joseph Muscat tore into former Opposition leader Simon Busuttil as the “most irresponsible politician Malta has ever seen” and called on him to quit parliament and any other post he held at a press conference on Sunday morning. 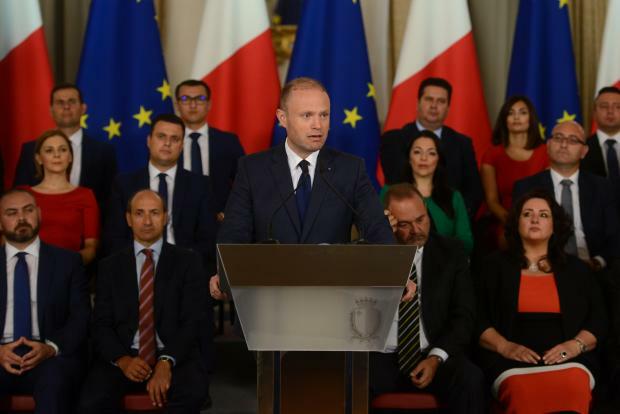 The press conference, held mere minutes after the Attorney General’s office had published a copy of the Egrant inquiry’s conclusions, began with Dr Muscat listing the various ways in which the inquiry had exonerated he and his family of claims linking them to Panama company Egrant. Magistrate Aaron Bugeja, who led the inquiry, found that signatures had been falsified, key witness testimonies did not match up, and talk of evidence being spirited away from Pilatus Bank not backed by CCTV footage. Dr Muscat teared up as he recalled the emotional toll the allegations, first published by Daphna Caruana Galizia and subsequently repeated on several occasions by former PN leader Dr Busuttil, had taken on his family. “We would ask each other whether the truth would ever emerge. That day has come. I tell my children that neither their mother or father is going to jail,” he said as he struggled to compose himself. He called on the current PN leader, Adrian Delia, to fire Dr Busuttil as his spokesman for good governance, if Dr Busuttil refused to step down on his own initiative. Dr Delia subsequently announced that he was stripping Dr Busuttil of his good governance portfolio and asking him to suspend himself from the PN's parliamentary group. It remained unclear whether the former PN leader would do so, having earlier dismissed the Prime Minister's calls for his resignation as "ridiculous". The Prime Minister reiterated that he wanted the inquiry published in its entirety – something he said the Attorney General was unwilling to do, as certain sections contained private banking information while others referred to people under police investigation. 11.11am: "The people's political judgement overwhelms me," Muscat says, applauding the electorate for returning his party to power last year. If Simon Busuttil had been elected prime minister, he would have had to resign today, he charges. "He is jealous and irresponsible... But I will not embark on a public lynching exercise." 11.07am: Muscat says he was speaking to his lawyers about the outcome of the inquiry. He says it was the country which suffered most because of this "lie". "Michelle and I are both relieved this nightmare is over." 11.05am: Asked whether he would stay on as prime minister, Muscat says he did not wish to enter into the issue at this stage. 11.04am: An emotional Joseph Muscat breaks into tears as he recalls how much his wife and children had suffered as a result of the claims. "We cried together, not understanding who would lie about us in this manner. The day of truth has finally arrived. I thank my children, who suffered with us. Neither of their parents will go to jail." His parliamentary group, sitting in the background, stands up and applauds in support. Parliamentary Secretary Julia Farrugia Portelli among those in tears. 11am: Muscat thanks supporters for standing by him, despite the claims. "I will continue serving you as Prime Minister." With his voice breaking up, Muscat says he's sorry the claims targeted his wife Michelle Muscat: "They took aim at her because they couldn't get to me." 10.58am: "Simon Busuttil will go down in history as having carved the biggest political lie in Maltese history." Muscat says he expects Busuttil to step down from every post he holds in Malta and overseas. If PN leader Adrian Delia doesn't sack Busuttil at once, he too would be an "accomplice". "He is the cause of a political crisis which endangered Malta." 10.55am: Muscat says he had always told the truth, but those who lied and tried to destabilise the country should shoulder their responsibility. "I have no shadow over me. This was a web of lies intended to hurt me and my family," Muscat says in a combative tone. 10.51am: He says the inquiry elicited contradictory and inconsistent statements from witnesses. It was hard to reconcile the versions given by Daphne Caruana Galizia, Maria Efimova, and former Malta Independent director Pierre Portelli. 10.50am: The Prime Minister is reading from the conclusions of the inquiry. He says the court makes it clear that CCTV footage of the former Pilatus Bank chairman from April 2017 does not prove that he was taking away any evidence or that he allegedly flew from Malta to Azerbaijan right after he was filmed on cameras. 10.46am: Joseph Muscat: "Someone falsified the documents. This was nothing more than a frame-up against me and my family. They wanted us to face court with a 12-year-prison term. They wanted to harm me and the Maltese economy." 10.45am: He says the "biggest lie in our political history" is now certified by a magistrate. The inquiry, almost 1,500 pages long, was passed on to the Attorney General’s office to be assessed.